The subject of the group which forms the Prize this year (and was sailed for on Wednesday) is taken from the Mythology of Ancient Greece. 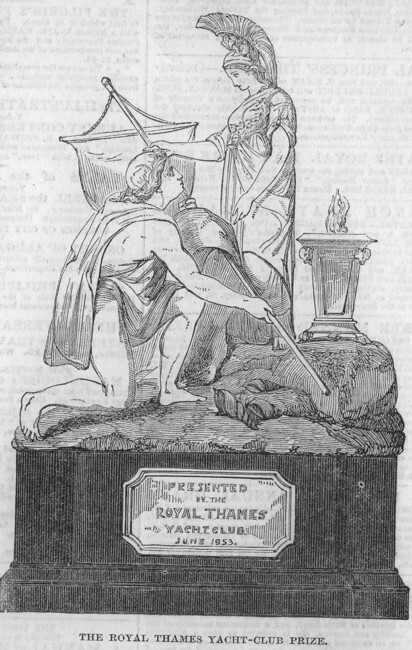 It appropriately represents the Invention of the Sail, which is attributed to Minerva, who, on the starting of the Argonautic Expedition in search of the Golden Fleece, is said to have instructed Jason in the art of navigating and controlling the Argus. She is here personified in the act of delivering to the hero her invention, which he receives on bended knees. By the side of the Goddess is the Sacrificial Altar. On the pedestal is inscribed the name of the race, and of the successful candidate. This very characteristic group has been designed by Mr. Alfred Brown and ably executed in silver by Messrs. Hunt and Roskell, of New Bond street. A report of the sailing is given in another column.